Does your business need a low cost but high quality color device? The Xerox Work-centre 6027 copier excels in small office environments where high-impact color, speed and ease of use give your team the opportunity to focus on what’s important. Your business. 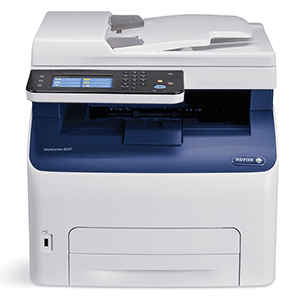 The Xerox Work-centre 6027 gets the work done without a second thought. This compact device combines several office machines into a single, cost-effective color multi-function copier. The Xerox Work-centre 6027 feature a print speed of 18 ppm in color and black and white and provide color prints in as fast as 13 seconds. The copier even has Xerox EA-Eco Toner. Developed to provide bright, detailed images, smooth graphics and sharp text with remarkable gloss and clarity – while achieving low fusing temperature to save energy. The toner cartridge in the device produces an estimated 500 prints per toner cartridge making it a super cost effective piece of kit. If this copier sounds like the right kit for your business, give us a call, we would love to help you. We are Xerox authorized and have been selling copiers for 10 years and we would love to help your company!